El SureStay Hotel by Best Western Helen Downtown se encuentra en el centro de Helen. Venga y disfrute de las mejores atracciónes turísticas cerca de nuestro hotel. Precios bajos garantizados y ofertas exclusivas. Con una céntrica ubicación en la calle Main Street, a poca distancia a pie de las tiendas, restaurantes y eventos locales, el SureStay Hotel Helen Downtown ofrece un espacio de alojamiento de primer nivel en Helen, Georgia. Disfrute de su estancia en nuestro hotel. This hotel was overpriced for the value received. In any other location, the nightly rate would be reduced by 50%. The carpet had not been vacuumed and the damaged walls simply painted over. The location was convenient to town. Best Western needs to either update these low-end motels or get rid of them. The property is older and could use more than a superficial updating, but all in all, we enjoyed our one night stay very much. I called several properties, looking specifically for an indoor pool that my 7-year-old grandson could enjoy (April is still too cold for an outdoor pool). There was at least one other hotel with an indoor pool quite a bit cheaper, but (when asked) they acknowledged that their pool heater was not working and had not been working for several weeks. That sealed the deal with Sure Stay. I always encourage people to consider why they are making a trip and what their end goal is when traveling. 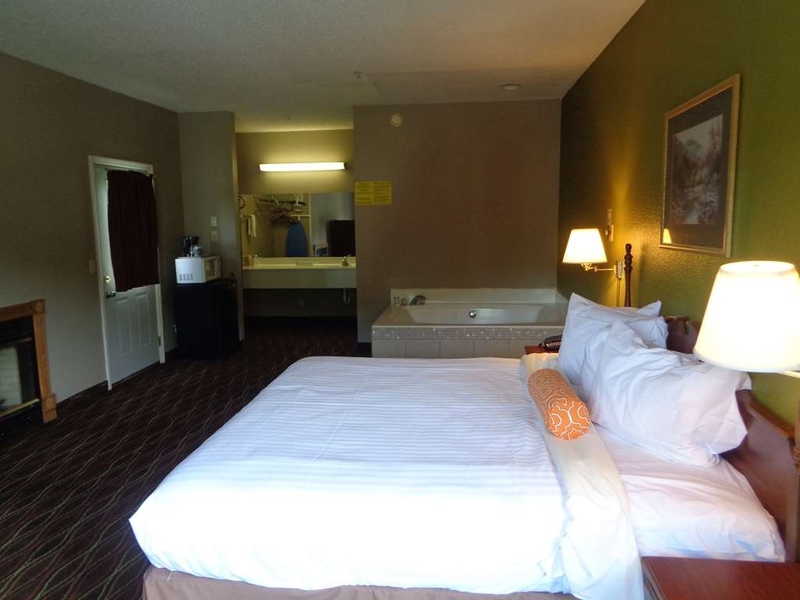 For this overnight stay, I needed a clean room, comfortable bed and indoor pool without breaking the bank. I got all three and more. The hotel staff, both on the phone and in person, were friendly, professional and personable. The beds were very comfortable, there were sufficient towels, hot water for showers and the Keurig in the room was a definite bonus. We used the fridge and the microwave, and my husband even touched up a shirt with the iron. Everything worked perfectly. What more can one ask? If I were going to stay for more than a night or two, I'd probably pop for a more expensive hotel with better breakfast options and lots of other amenities - assuming it was updated, of course. But for our purposes this property met our needs just fine and I would definitely consider staying there again. We stayed here for one night. The room was very nice beds are very comfortable and I was very surprised that they had free breakfast. This is a great little hotel and I would recommend it highly. They have a heated pool which is very nice. close parking near your room. Everybody was very friendly if you need a place to stay pick this hotel very reasonable price and very comfortable. "Room stinks, lighting dim, night clerk rude!" I would have preferred to stay in a hotel that was newer. Carpet had an odor , along with the room, and lighting was dim. Place needs an upgrade. Something in the room was biting us and left me and my son's legs itching. Also that night I realized I needed a cot and asked the older lady on duty for a cot and she was rude and not helpful chastising me, saying "you should have told us you needed a cot by calling us after you booked the room", how rude needless to say never got a cot recieved a blanket and pillow, lol and told use it for the smelly floor that had a 300 year old odor coming from it yuck, smh. My daughter and I love to take time to get away by ourselves. This weekend we chose to go to Helen. It was a chilly, rainy Saturday but we enjoyed our day. The SureStay is an older hotel so we didn't expect a lot. The bathroom's toilet paper holder had no roll in it. The toilet paper was actually sitting on the floor. We kept it either on the back of the tank or on the rim of the tub. The first morning the housekeeping came by before we left the room. They handed my daughter new towels but never came back and made the beds or emptied the trash. Neither of us slept very well on the mattresses, they seem to be older. A close walk to town and everything around. They have so many restaurants and a putt putt for the family and many shops to glide through. Make sure to watch the Glass Blowing. The beds were comfortable, pillows nice and fluffy. We stayed here for years back when it was the Super 8 motel. This was our first time since changing over. And boy were we impressed! We got a room with a jacuzzi tub and a fireplace. 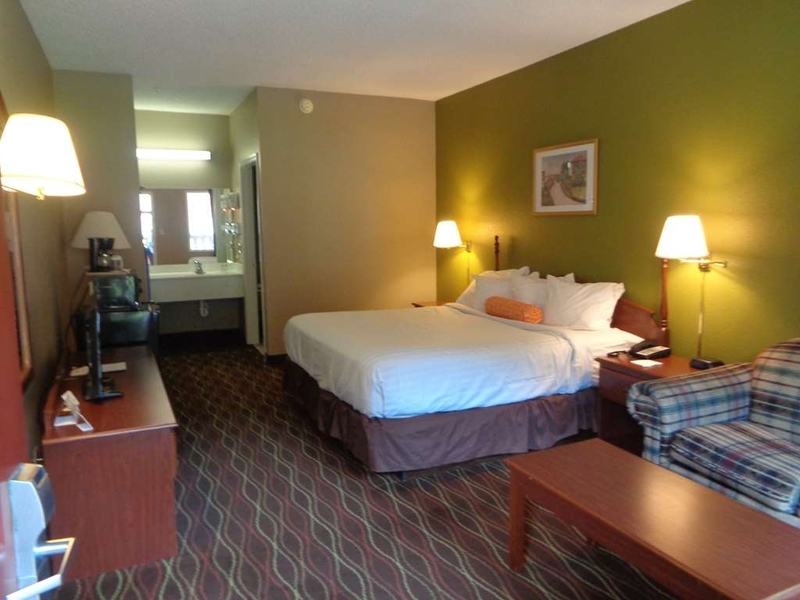 The rooms have been renovated and are very nice and modern, including laminate flooring. Great location so you can walk to anywhere in town. We will definitely be back! This is a great location walking distance to downtown helen. However the rooms are outdated even though they stat they are remodeled. Also unsure how well they clean since we found pjs from previous guest in room. Our family goes to Helen every year for New Year's Eve and we had booked at this hotel once before, several years ago. It was absolutely horrible. I knew that they had changed owners and we were willing to try our luck again because the price was perfect for our budget. We were not disappointed at all! The front office staff was efficient and we were able to check in a little bit early. We stayed in the newer part of the motel, our room was clean, our beds were soft, and our towels were fluffy. The continental breakfast was decent. The walk to the heart of Helen was easy. But the absolute best part of our stay was the heated in-door pool. My daughter and I had a GREAT time swimming around and standing under the heated waterfall. It was a really fun time. After our first awful experience, I'm glad we tried again. We will definitely be back to this hotel next New Year's! This motel is in need of some serious updating. Dark, dingy rooms, without many electrical outlets. One lamp was all the lights that were in the main room. We booked for 2 nights, but only stayed one we went to the Hampton, much better. Best Western should visit this place to make sure its name brand doesn't take too much of a hit. We got into the hotel late Sunday night. We had a long stressful trip and were happy to rest for the night. Upon entering Helen, we were so impressed by the Christmas lights and town, we changed our travel itinerary. We canceled Gatlinburg and moved our Maggie Valley reservations out by a day. We also changed rooms and got a king suite. The staff were very helpful and we had a great time. This hotel is located well and has a Huddle House next door. City Hall is across the street (and up the hill). Stay in the suites, they are well worth it. 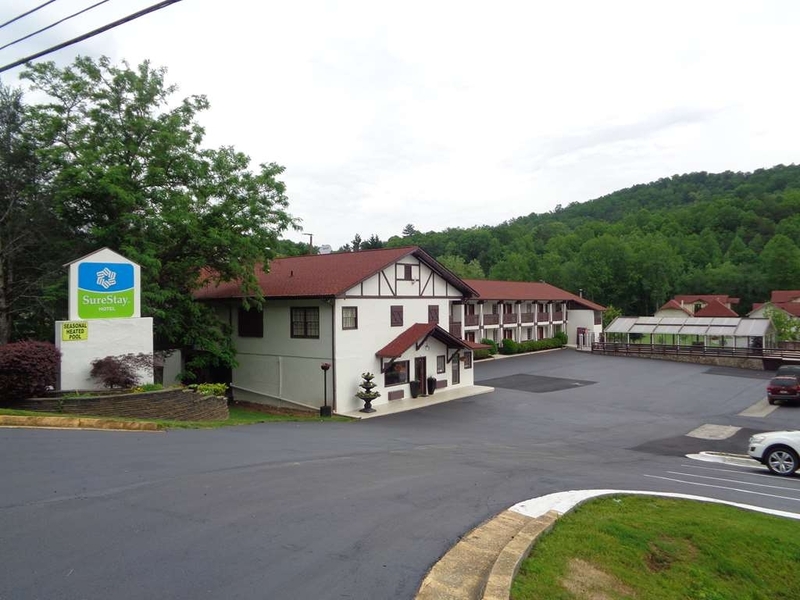 This hotel is in an excellent location, walkable to almost anything in the town of Helen. The beds are fine and the room was clean. However the lighting was very poor (for instance, no bedside lights and just one dim floor lamp and one very dim desk lamp), dogs in the hotel barking throughout the morning and evening that calls to the desk did not stop, nothing to find TV channels, poor continental breakfast, and very basic amenities. On the plus side, there's an indoor pool which we used years ago when the hotel was owned by another group. We come to Helen regularly, but will not likely come here again. "Great location but not too clean"
The rooms are being remodeled. The flooring is old. Staff was friendly. The reason for the low rating. Our carpet was dirty and they did not vacuum during our stay and it was obviously dirty. The location is great for walking. Older hotel been remodeled and somewhat updated. Location good but steep driveway. Continental breakfast was good and coffee in room. Staff very helpful with directions and suggestions. Helen is beautiful but be careful when you park. $5.00 every time you park and still have a good walk. This hotel is within walking distance. Good clean rooms. Lady "B" was great an friendly went out her way to make everything perfect. I'm be going back there for sure because of her looking at for the guest. Walking distance to most things I'm Helen. "Good for what I needed"
A very simple room, clean, but you can tell this place needa a little work. I stayed one night and didnt really need any amenities so it was perfect. Continental breakfast was ok. Wasnt looking to eat there since i knew i was going to the German place down the road. We had a group of 30 friends stay here for 5 days/4 nights. All of the rooms had been pre-assigned, however when we arrived all of those selections had been changed. No reason given. Check in process took what seemed like forever. So everyone got off on the wrong foot. We we told the facility had been upgraded recently. NOT TRUE. Maybe, new paint, and new carpet and beds... BUT, all furnishings were very well used. Old bath fixtures. Old a/c units were not functioning properly. The a/c unit drains were clogged not allowing the water to drain outside.. So it was just being blown back into the room making everything feel dampish. Three people got sick while there. 4 people came down sick immed after the trip. The included breakfast was a joke and not enough seating. After the first day we all walked next door to the Huddle House. Maid service was hit or miss. We got skipped 2 days as did most other rooms. Two couples moved to a different hotel. One couple just packed up and left town. What a GREAT BIG DISSAPPOINTMENT from Best Western. They should be ashamed to even own this property. ??? anything good to say??? Yes... it was CHEAP .... we got a special group rate of $70/night. You get what you pay for. Yes, it's a little older, but the location is great. Right on the main drag, but just outside of the busiest part of town. Our room is clean. It has a mini fridge and a microwave. It has an indoor heated pool, which was a great surprise for our son. The front desk was very nice when we checked in. Considering we're here in the middle of Oktoberfest, it's a great deal. We were told everything was renovated - not so. The bathroom was so tiny and rust around. No hair dryer - we had to go to the office to borrow one. The bed squeezed so badly, it woke up bedpartner by just rolling over. Breakfast was pretty awful. The only good is we had clean sheets and towels. Jacuzzi in bedroom was really stupid. Would never return. I was surprised to find a room available in Helen during Oktoberfest on relatively short notice. So I was going to be ok with this place regardless. But it more than met our expectations. It is just a 5 minute walk to the river along Main street. Room had 2double beds, microwave, fridge, and coffee maker. AC was needed and worked well. Room was spacious and very clean. There was a slight smell of mildew but that was the only complaint. Check in and out was quick and easy. The room was clean and comfortable, which made a long day on the road more bearable. Nancy at the front desk was unbelievably helpful with local information, and even went to bat helping us find a hospital for one of our injured motorcyclist. She went went far above the call of duty and is to be commended for her kindness and help. What a great place to stay, nice pool, too. I spent one night. The room was ok. It seemed to be pretty clean. TV was ok, WiFi worked well. It had a fridge and microwave. Some of the furniture was beat up. The bed was nice, slept well. Walls are a little thin. Neighbors were a little loud. The door to the bathroom would not close because it would not clear the new toilet. Shower worked well, plenty of hot water. Breakfast was ok. Cereals, coffee, juice, bagels, toast, yogurt, sausage biscuits. The swimming pool was great! I would stay again, I got a good rate. Easy to walk anywhere. I was really impressed with this motel. It was super clean, a really spacious room. Had a Keurig coffee machine complete with some K-cups. Located in Helen in the middle of the Alpine village, you can walk to anything there. It was a great price for the convenience. The beds were very comfortable. There was a free breakfast, which I did not partake in. Also had an indoor pool. "Good for one overnight stay"
We are BW Rewards members so I wanted to use all my "travel rewards" before they expire. This is seriously the closest chain hotel to downtown Alpine Helen (The Helendorf Inn is the closest). We walked out our hotel room door and literally 3 minutes away we were on the bridge overlooking the Chattahoochee river! It is an old but quaint hotel. Nice gal at the front desk. Our room was not facing the Main Street so we were happy, but as soon as you walked into the room it felt like a cave. It was cool and very damp!!!! Opening the door didn't help either. We cranked up the a/c to 72 and left to go tubing. We arrived 4 hours later, and nothing improved. Perhaps the rains and the river has caused this increased level of moisture in the room. The sheets felt a bit moist too; however I got the best night sleep! Nice semi-firm beds with nice side-sleeper pillows, too. Continental breakfast was decent but nothing to write home about. The motel staff was excellent, very helpful both when making reservations and check in. Room was clean and good size. Lots to do within,walking distance, dining and shopping. Nancy at the front desk, was very helpful with local knowledge, suggested a couple of great places to eat. There were bugs everywhere, most dead, some alive. Bathroom was dirty, there was hair too. I cleaned (had Lysol wipes with me). On arrival I tried to check in an hour before and the front desk was not helpful at all and rude about their flat out “NO”. We travel a lot and usually find all hotels very accommodating. I expected more as I saw good ratings for hotel, very disappointing. This place has seen better days. It's in a good location in Helen. The breakfast was good and that's about it for plus marks. The bed was was past needing to be replaced as were the towels, carpet and sheets. We were there on a cold, rainy January weekend and had a hard time staying warm in the room. This is a great value. The motel is close to everything. The room and facilities were very clean. The staff are very warm and friendly. We stayed one night during a very busy time and wished we could have stayed longer. We would definitely stay here again. "not a good place to stay"
This hotel is within walking distance to downtown. The rooms have been updated recently. They are clean and roomy. The front desk was helpful every time we had a question. The breakfast was lacking but you are right next door to a Huddle House. We will stay here again. "Second best go to country inn"
This is a very nice place to stay. Nice room and staff. It is very close to down town. We like to walk to town every day. There is a nice park very close to the hotel. The best time to go to Helen is on the weekend. We stayed as this hotel for a week. The room was always clean as well as towels and sheets. Friendly staff and well located with a walking distance the to the main street. Breakfast is averaged but, it's not like in other best westerns I previously stayed at. No eggs in any form, sausages or patties, only plain bagels & bread, it worked but definitely can be improved. The facility needs maintenance, my toilet was loose, the bathtub didn't drain properly and the floor needs to be replaced. If your are looking for a cheap place on a short vacation it will help but I only can give it 3 stars. "A charming location with an aging motel"
This is a basic hotel, there are no frills, it's a bit dank, dark and dreary, hard to heat. It's at one end of town without the action, which I guess during tourist season means it's fairly peaceful. It's dated, but the bed was comfortable. This place is not pet friendly! It's not like this place is top 10 in Helen.. It's run down, needs to be updated.. I've stayed here several times in the past and it just gets worse.. I stay at the Helendorf that is very very nice and pet friendly! We stayed here for 2 days, while chasing waterfalls, on our adult spring break 2018. A very nice, quiet hotel, centrally located in the middle of town. We were able to walk most places, until we went to the waterfalls. The price was reasonable and the front check in persons were very friendly. We will definitely recommend this hotel to everyone. 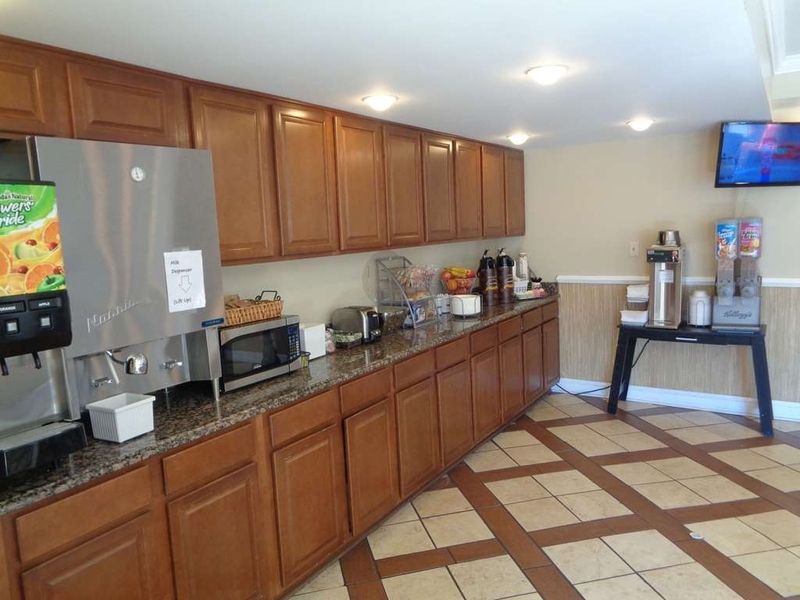 "Pleasant Setting & Courteous Staff"
Great location for walking to restaurants & shops. Quiet rooms, well maintained & across from a manicured hedge welcoming guests to Helen!! We reserved on line & were not disappointed when we arrived... Anna, welcomed us warmly & when we arrived home she had called to let us know that room service had found a "left" behind valuable. thanks & gratitude. "Good motel close to Helen"
Good motel with clean rooms and comfy beds. Pool could have been warmer as it is still cooler in the area though. The hotel is in transition of owners but I was assured by Jenna that the continental breakfast will get better, right now its a joke. The pic says it all with the hand for size comparison. They also had bread & bagels, and 2 types cereal with milk. Apple & orange juices and coffee were offered for drinks. Spur of the moment stop on Christmas Eve, room was clean and hotel was convenient for a walk through Helen. Desk clerk was awesome, polite, professional and helpful. Surprised to find same desk clerk at check out and another wonderful experience. Will definitely stay again. "Improved. And still the best value for the money in Helen"
This is my second Review of this hotel. Several years ago I wrote a good review here when it was Super 8--or something like that. Last year (early 2017) we went there and the experience wasn't that great because the room wasn't good. I think they were in a transition to Best Western ownership then. I didn't write a review then. Anyway, we just went there for two nights (Dec. 30/31, 2017) for New Years Eve and had a great time. The check in was running late--even past 3 PM. It was too cold to keep killing time outside. The young guy at the front desk, upon our request, accommodated us to an upgraded room. The staff was very friendly. The room was a bit dated but everything worked fine. There was even a Keurig coffee maker. The location is the best value! Right next to a 24/7 Huddle House and to the shops and restaurants. I loved swimming in the warm pool when it was very cold outside the enclosed area. It really is the best value for the money in Helen!! Even if we find some other nicer/upgraded hotels at competitive price, the location of this hotel and the heated pool are compelling reasons to go back there again and again. My family and I care here cause my grandma stayed here last y at and they had a great room. And this time we had a great room too. For people that are disabled you can ask for a specific or down stairs room. My grandma needs it and they checked and they had a room just for her it was so nice. So I highly recommend this place for people that are disabled or in wheelchairs. And the room was very clean my family and I were very pleased. Years ago, we stayed at this hotel when it was owned by a different chain. 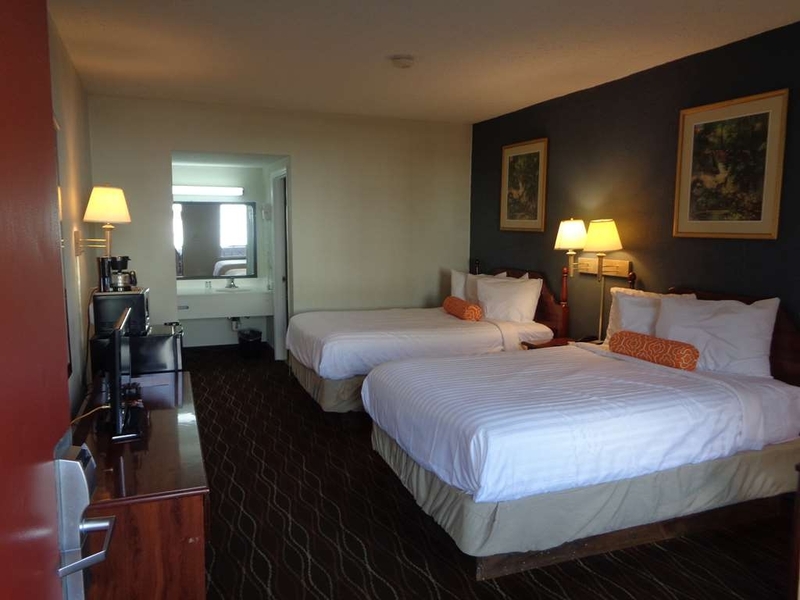 The Surestay is currently being updated by Best Western and we truly appreciated the changes. Very, very comfortable bed, clean rooms, excellent customer service. There were a couple things that were uncomfortable; such as one chair and no tables, tv sat very low and could not be seen when lying down on bed, thin walls and very dim light bulbs. All in all though, we were very comfortable and pleased with the value of the room. Yep, we will definitely stay there again. "Decent no frills basic motel"
The SureStay is an older motel 8 that was bought out. They have been doing some fixing up, replacing carpets, bedding etc. It was a decent place to stay for a short weekend motorcycle trip at a fair price compared to the other more modern Hotels which were twice the price. If this place was anywhere else I would not have chosen to stay here but it also would have been much cheaper. The bed was comfortable. The room and bathroom were clean. The heat/ac worked tho it's a noisy wall unit. 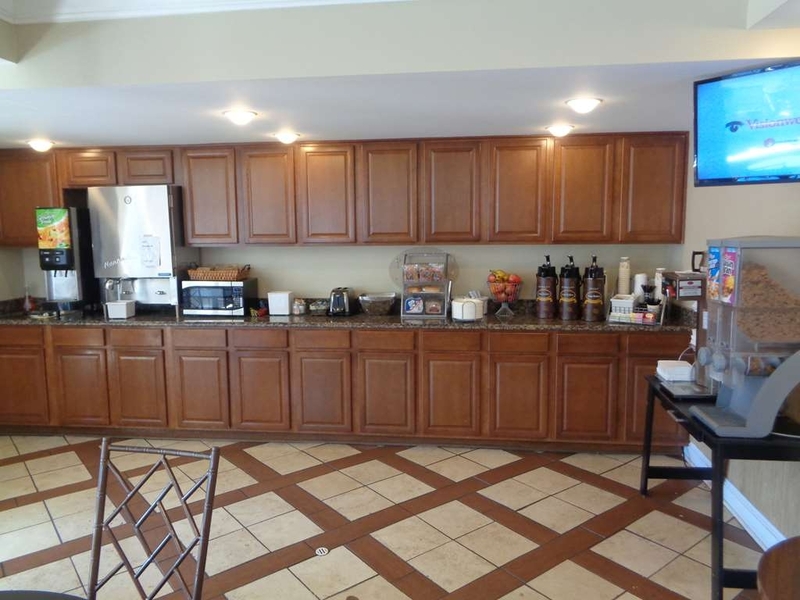 The continental breakfast was extremely basic. If it's a short stay and your looking to keep your expenses in check and a comfortable bed is all you need with a hot shower you'll be fine. If you like the modern chain hotels pay twice as much and stay there. You won't be happy otherwise. "Clean, Quiet, and plenty of hot water." A run of the mill hotel/motel room. Beds were okay... room was clean... A good value. Within walking distance of almost everything. GPS location had us going in circles... but we found it. IF I ever return to Helen I would stay here again. 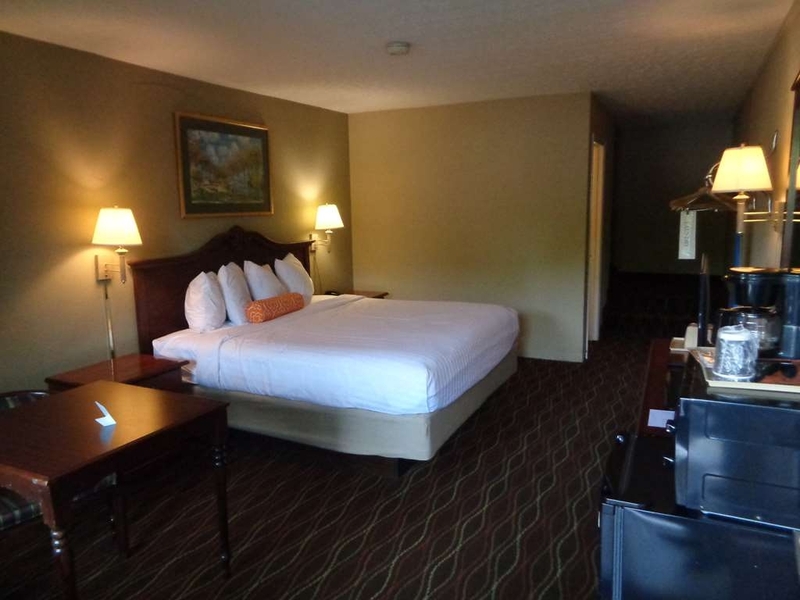 This hotel is within easy walking distance of all the Octoberfest events and bars. It is an easy walk if you have enjoyed a few too many German beers. The bed is extremely comfortable. The facility is old and the building does show some wear but it looks to have been recently upgraded. The only downside is that the walls are a bit thin making noise a bit of a problem. After ditching a slum hotel down the street, my significant other and I went to the SureStay to get a room!! We asked to see the rooms before we booked and it was not a problem at all for them to show us. 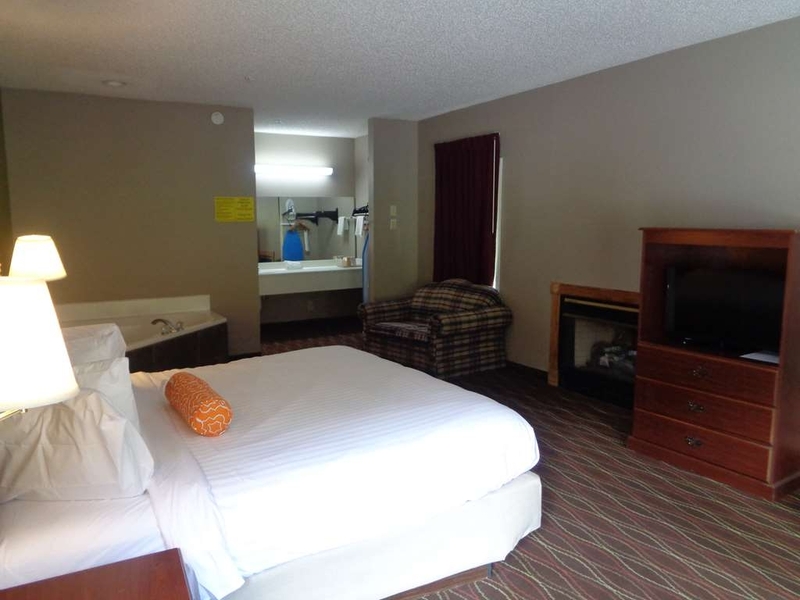 The rooms were clean and a great deal for how close it is to downtown. Lee and Daniel were amazing, extremely helpful, and made us feel right at home! We really appreciated how accommodating they were for us. I would recommend this hotel for a nice, clean place to stay. Went to Helen for our anniversary. Hotel employees were very nice. Upgraded our room. Jacuzzi tub was wonderful. Bed was comfortable. Only issue was some ants around the sink, but I think they are upgrading. Would stay again. "One of the worst we've stayed at." 09/02/2017 Our first time in Helen Ga. Liked the town, hated the hotel. The rooms are very dated and smell bad. The employees were nice but in the three days we were there our room was never cleaned. The "do not disturb" was not on the door. On our third night I went back to the desk again and told them our room has still not been cleaned. Her final solution for us to have clean linen was to have us move from an upstairs room to a room downstairs. It would have been too much for her to just give me 2 clean towels and washcloths. Best Western / SureStay really let us down on this vacation. "Great Value in Downtown Strip— Stay parked here and Walk to Shops!" Nicely updated motel just a couple of blocks from the tourist shops, Festhall, activities, and restaurants. During our midweek visit we enjoyed the enclosed pool (open till 11PM) and the bountiful breakfast options (served in lobby area till 10AM)...both great for us night owls! Reception and custodial staff were all cheerfully helpful. "Great for a weekend Getaway"
"Good for a weekend in helen"
We had a very nice stay at SureStay. Our room had a fireplace and jacuzzi which wasn't mentioned in the description and that was an added plus. 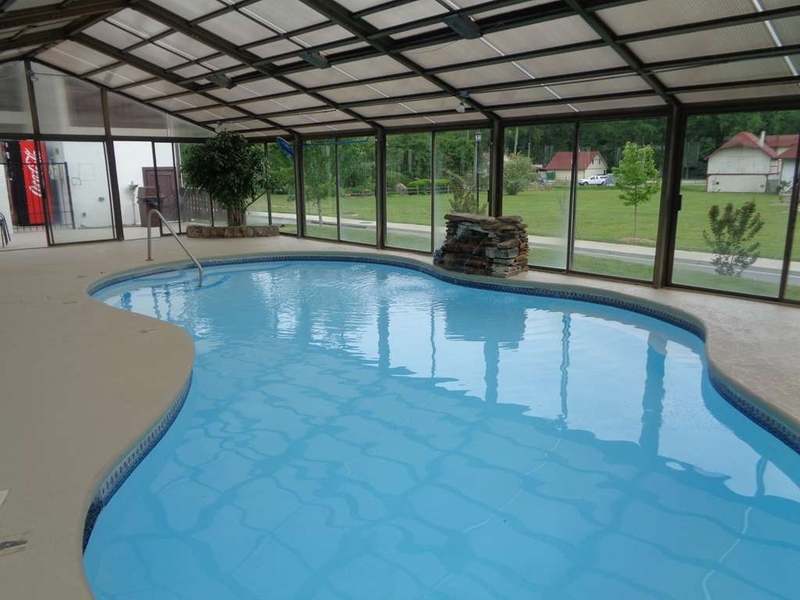 There is a heated indoor pool also available but we did not use as we didn't stay for long. But there is room for improvement. Though the plumbing looks new the furniture and upholstery are old and faded and torn at places. Also the place needs a good dusting. Especially the balcony. We saw some cobwebs there and refrained from going back there again. The view from our room was very beautiful but it was spoilt because of a dumpster parked right outside. But all in all I should say it was good for the price we paid. The town is gorgeous, hotel has beautiful views and walking distance to everything downtown. The staff is beyond friendly and out going. We were evacuating from hirricane irma and this place helped ease the stress after a very long drive. Very clean. Stayed for two nights on Labor Day Weekend. The shower really needs a handle for getting in and out. The shower could be cleaner also. The beds are comfortable. The continental breakfast is OK. No waffles. The hotel does have an indoor heated pool. I didn't use it, but children were really enjoying it. We made reservations several months ago and got great rates. We had stayed here when it was over 5 years ago. It is transitioning to a sure stay. There is a lot of remodeling and a great need for it. Housekeeping is a laughing matter. The rooms are musky and smelly. We bought air freshener and placed them in the room and left for 5 hours, when came back the odor was gone. We cleaned our on room after the housekeeper walked in and we told her to come back later, she never did. We told her we didn't need her to clean our room the whole 3 days we were there because we had cleaned it and didn't want her to mess it up. We went got our own towels. We left the soap and razor cap on the rim of the shower where we found it when we checked in. They had changed the room rate on us for one night but they changed it back with no problem. When we advised the nice lady at check out about the room she knocked off a big chunk of the bill. Daniel is the nice guy who fixed the room rate problem and Tonja checked us out. This hotel needs a lot of work but I have to say they are trying and in time it will improve. I will give them some time and we may stay here again. "Disappointing stay.....not a place we would stay again"
All the employees here seem to smoke. We do not smoke and don't appreciate being subjected to it every time we open our door or walk down a side-walk....and yet there it was. Curtains on the windows were wrinkled like they just came out of a dryer without ever seeing an iron or at least a steamer! Room had a table and ONE chair that was stained. Overall not the nicest place we have stayed though it was walking distance to most of town. If this is a Best Western its a far cry from the one we stayed in the night before in Roanoke, Va.....which I just gave an EXCELLENT review of....talk about opposite ends of the spectrum!! Very steep driveway to get in and out of. Breakfast was extremely lacking.....next morning we ate at the Huddle House next door......There are better choices in town. Would NOT stay here again, or recommend it to anyone! Staff was excellent, hotel was nice and clean. Super value for what we paid with an amazing location. Room was clean, pool was nice and simple. Breakfast was included. Serious value. Will stay again thank You!!!!! I chose the SureStay because the rate was best, and it was close to downtown. Our room was not ready, but Debbie moved us to another first floor room with handicapped bathroom due to my strained hamstring. The room was clean except for the carpet. My white socks were soon black. The remodeling and updates were a little odd, especially the shower. But if you want hot water, this is the place to go. First morning, I wanted my usual cup of tea and started water in the coffee maker. I brewed my tea only to find that the coffee maker had not been cleaned, and there was a used coffee bag in the maker. Debbie was mortified and replaced the brewer with a Keurig. We were resting in our room during a storm when the door suddenly was opened by a housekeeper who had not knocked. Thank goodness we were not indisposed. Also, the ice machine outside our room was completely dry. Overall, the staff was helpful and nice. I don't really think I would stay there again. "Carefully check your room beforehand." We moved our stuff in and got comfortable. Then realized there was no table or chair in the room. Must be real economy mode. We were too tired to complain and wait for a fix. The room smelled strongly of disinfectant or cleaner when we moved in. One bed was okay, The other was broken down on the edges. Since our stay was one night, we decided to stick it out but will not go back there. The staff was friendly. The breakfast was fruit, cereal or pre-packaged rolls. Location was walkable to downtown Helen. We were among a convention of people who filled every available room in this resort town. The front desk ladies were working hard to stay up with everything. The room was fairly clean, but very worn, and a lampshade was in shreds, which was the first thing I noticed when opening the door. Obviously, this motel must have been here for years. Breakfast was sparse, but coffee was good. Only three tables in dining area made it impossible to eat there anyway. Don't plan to ever stay there again. No longer a Super 8 Motel Not sure what motel chain this property is now... I would sure check the rooms before I stayed. The heated pool is still a plus for this property. Huddle House is next door. Town is within walking distance. Made reservations for five nights several months ahead of stay. Since there was a group of us staying there needing five rooms I requested that they all be down stairs and as close together as possible . Person taking reservations said it would be no problem. Upon arrival there was no signage for the motel only a bikers welcome extra security parking. Checked in and I was upstairs like several others and we were spread into different areas of the motel. Renovations were being made to motel and the noise and dust during the day until 6 pm every day was horrible. Last day of our stay the rooms were not even cleaned . When I asked if my room was going to be cleaned the answer was we are short handed today . Finally my trash was taken out and new towels left on the chair. Only reason I am giving this place an average grade is because of the daytime office employees. Next visit to Helen I will stay somewhere else . The staff at this hotel went out of their way to help us enjoy our trip. They suggested a great restaurant, helped us report a problem with another hotel that hadn't lived up to the standards of the choice brand, extended breakfast hours on our day of departure and much more. This has just become a SureStay hotel and is in the process of a much needed remodel. The bed was comfortable enough and the room was clean but dated. There was a lot of trash piled up at the end of the stairs and stacks of broken down boxes under the stairs. Breakfast was well stocked but not a lot of variety like you find in a pricier hotel. It was a pretty good value at $41/night!